Opened in 1987, Northbridge Mall was the second enclosed mall for Albert Lea, luring shoppers away from then-20-year-old Skyline Mall across town. Its anchors are ShopKo, a Green Bay, Wis. based discount retailer similar to Target and Wal-Mart, and Herberger’s, a Minnesota-based mid-tier department store now owned by the Bon-Ton Stores Inc. Northbridge Mall has about 250,000 square feet of retail space and contains room for approximately 30 stores, services, and restaurants including a food court. There’s also a 7-screen movie theatre. Also, I suspect it was built as a complement to Southbridge Mall in Mason City, Ia., which is about 40 miles south of Albert Lea. Could be a coincidence, but I don’t think so. But why was Northbridge built anyway? Skyline Mall was only about 20 years old at the time Northbridge was built in 1987. Plenty of malls last longer than 20 years, but here are some reasons Skyline was outmoded then. First, Skyline had already lost anchor Montgomery Ward, IGA, and several other stores during the mid-1980s. Instead of renovating and repositioning Skyline to be the modern mall everyone in the 1980s wanted, the residents of Albert Lea elected to build an entirely new mall closer to the growth corridor along I-90 and I-35 completely across town from Skyline. In doing so, Northbridge Mall and the nearby Interstates provided a magnet for other retail growth in the area. In fact, most recently, Wal-Mart left its post at Skyline Mall, leaving it anchorless, as it built a brand-new Supercenter along I-35 not far from Northbridge Mall. Although it is small at 250,000 square feet, Northbridge Mall was what Albert Lea wanted and needed when it opened, a bright, modern palace of retail located close to transportation and growth. Skyline mall was the opposite of this, so it was left in the dust. 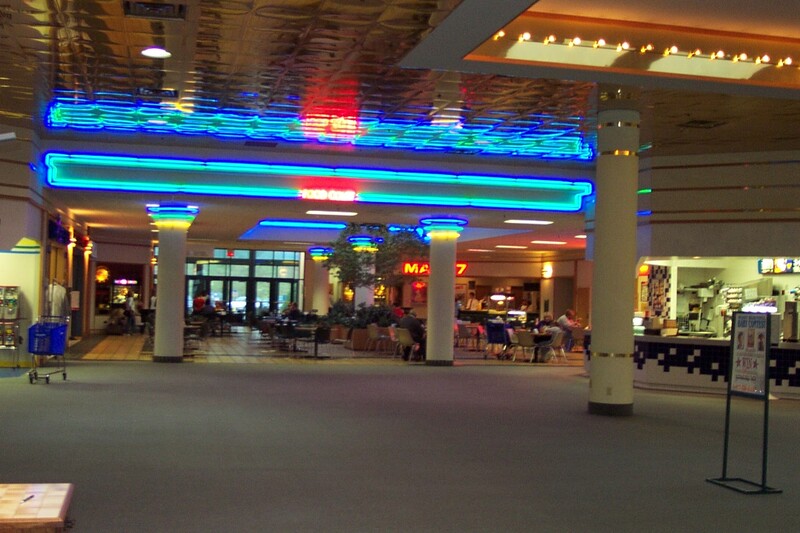 The decor of Northbridge Mall, at least as of 2001, reeks of the 1980s. Huge walls of circular bulbs, blue and pink neon on the ceiling, and geometric pastel designs original to Northbridge Mall paint a picture of days gone by, certainly not representative of the designs today. If Northbridge Mall was in a larger or busier area it would have been renovated years ago. Personally I find Northbridge’s style endearing and a call back to my youth and the times I spent shopping in malls with similar decors, only they’re all renovated now. There’s nothing wrong with it, either. The carpet looked like it could use a replacement and that’s about all. Ironically, Northbridge is about the same age now as Skyline was when it was outmoded. The dated decor is far from modern by today’s standard, but the mall is also utilized to capacity. But will Albert Lea residents elect to build another, brighter mall now? Probably not. The pictures featured with this post were taken in September 2001. As always feel free to comment. The interesting thing about this is that there is another mall about 20 miles away in Austin, MN (Oak Park Mall). I’m not sure why 2 small towns so close by would need 3 malls. Uh oh… low ceilings, and not many skylights at that. The kiss of death. And thirty stores to boot. I hope it can make it. Strong anchors always help. Unlike the sad Skybridge Mall, call me a person that gets too dazzled easily by pics if you wish( :P), but I really, really like the colorful design of this mall!! 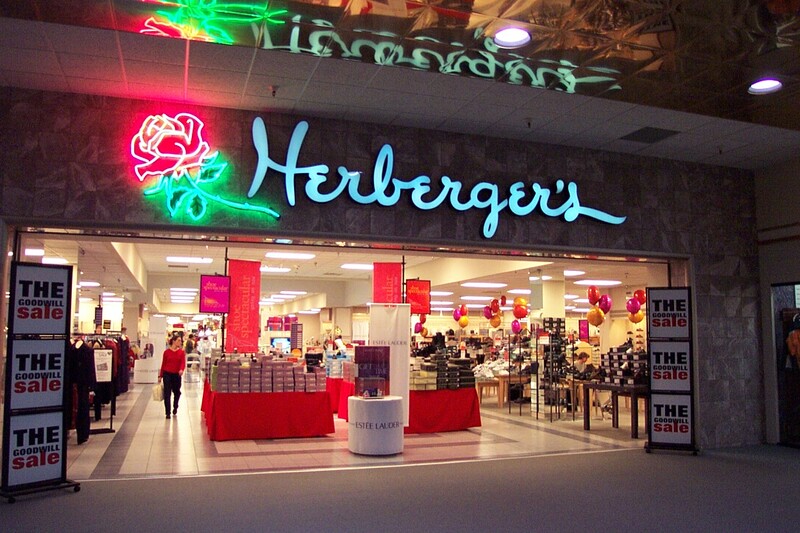 Not to mention I really dig the lovely-looking neon rose right next to the Herberger’s sign on the interior, and the neon lighting by the food court! The only things I find this mall could improve upon is that the green carpet really needs to be changed, since I could care less for that carpeting. And the bland, white colored entrance to ShopKo could use some updating, too. Maybe for all I know, that could be an older ShopKo location, but I have no idea, considering that I’ve never seen one of their stores in person, either(and have only heard of that chain, thanks to the internet). Oh, and Northbridge has its own website, with some additional pics of the mall: http://www.northbridgemall.com/ Interestingly too, a pic of a Dairy Queen in the food court area is shown, which isn’t there anymore based on the tenant list, lol. You aren’t kidding; those neon, mirror ceilings blast 80s. As far as malls not renovating with the times, you’ve mostly got it there. But in my home state, there are plenty of malls with outdated decor and are vital today. 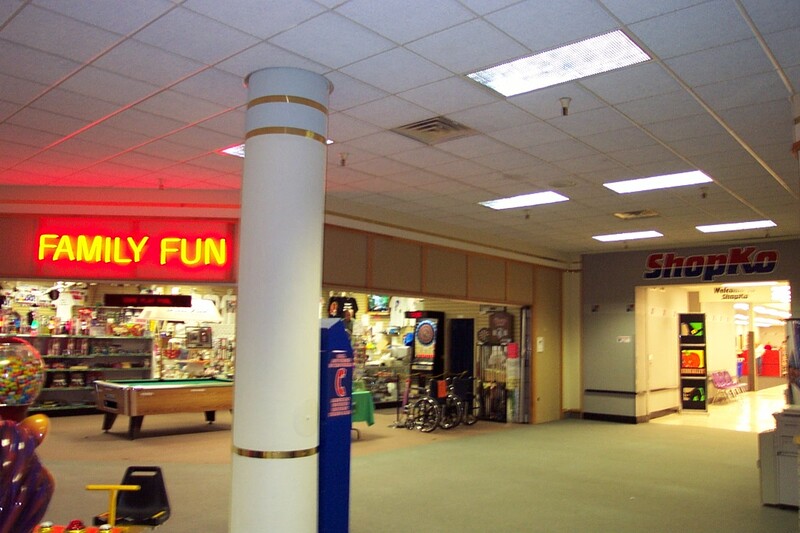 Crystal Mall in Waterford, CT, Enfield Square in Enfield, and even Holyoke Mall in Mass. feature plenty. For the most part, they’re updated accordingly with hip storefronts and usually feature some outdated flare. I’ve also noticed this mall has an odd, small indoor entrance for ShopKo; appearently not as glam as the big guys Wal-Mart or Target. 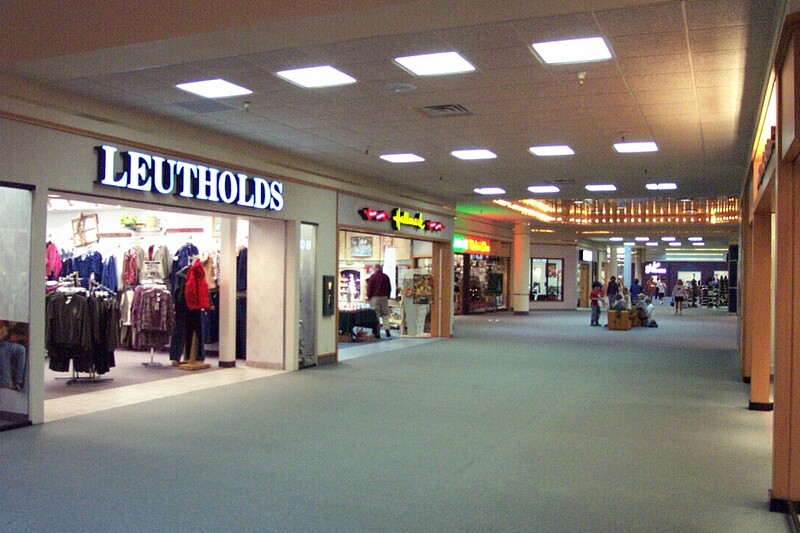 Let’s also not forget the carpeting – it’s cozy, but always a wrong move for malls hoping no one ever vomits on them. Now there’s another mall in CT, Danbury Fair, which is uber-successful, built in 1986 (non-renovated since opening as well), and doesn’t feature any of that tacky 80’s junk from this mall . Perhaps it factors into Fairfield County’s richer economic base built with an upper-scale image (and by better, more talented contractors too). What it boils down to is how much these owners are willing to pour in versus the socio-economic plane of the town/city. Wonder how this mall is doing five years later? I forgot one more thing; it’s seem a little uncommon to build a one-level, indoor mall in ’87 while the breed was dead or dying (by the mid 70s) in favor of strip and the two-level standard. They should’ve realized the quick-striking DOA this before they conceived it even if the area might only cater to smaller droves of patronage. Good point xismzero, I don’t disagree with ya one bit that there are older malls that definitely thrive, despite being designed during an earlier era, and not getting renovated much(if any renovation) at all. 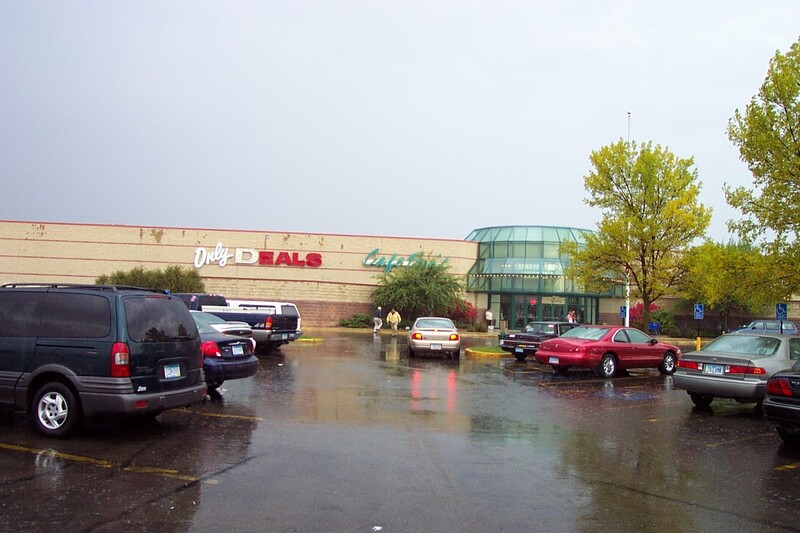 Golf Mill Mall up in Niles(north of Chicago) is a good example of one that still thrives, despite that it opened back in 1961 as an outdoor shopping center(a la nearby Old Orchard Shopping Center to the east), and was only enclosed in(I think) the late 1970s. I’m sure there are plenty of other examples of malls(besides my example, and yours of Danbury Fair) that haven’t gotten much of an updated look in later decades, and are still thriving and kicking today. It’s hard to imagine a mall that only has 250,000 sq. ft. of space, as there are many anchor stores alone (in other malls) that are larger than that. Just how small is the Herberger’s, ShopKo, and the inner portion of the mall (when taken seperately)? I love that old Herberger’s logo with the flower. Does anybody know when that logo was replaced with the boring logo that is currently used by all the stores owned by The Bon-Ton (except The Bon-Ton itself)? Unfortunately, just recently this year, the same bland logo replaced the familiar Elder-Beerman logo. This mall is really ugly, but it’s endearing in its ugliness. You gotta love the neon. AHHHH! The ’80s are back!! I’ve been to a few malls with the same kind of look before they were either remodeled (Fox River Mall in Appleton WI), or de-malled (Paradise Mall, West Bend WI). Both of those malls, before remodeling or de-malling, had the same details that Northbridge Mall has…..the rows of marquee lights and neon. Looking at it now though, ‘ugly’ is putting it nicely. Elaborating on Golf Mill, while it’s more ‘downscale’, is holding its own. Put the fact that it hasn’t had any major facelift since its initial late 1970s enclosure project, and it has really stood the test of time. Vacancies riddle this mall like most others of its kind, but while most others just faded away into obscurity, they seem to find new uses for dead space. I forgot one more thing. ShopKo anchoring a mall isn’t common, but it’s not unheard of, especially in MN, Upper Michigan, WI, IA and IL. However, it only happened in smaller communities. Paradise (West Bend), South Towne (Madison), Shopko Plaza (Wi Rapids), Centerpoint (Stevens Point), Northland (Appleton), Westgate (Racine) and Bay Park (Green Bay) all are locations anchoring a mall. The bad part is that most of these cases, the malls they anchor are dead or dying, and have since been shuttered, reconfigured, or torn down to make way for more boxes. The main problem was tenancy….all the chains that once resided in these small malls have all gone out of business, or fled to bigger malls. That’s why Northgate sort of delighted me just based on these pics. Herbergers ‘is’ a strong anchor…they pull in a lot of loyal customers, as is ShopKo. I liken Shopko towards Target more than Wal Mart. While household goods and such aren’t cheap like W-M, other areas like furniture and electronics are supposedly of higher quality. That’s why they’ve been able to stay alive in many of the malls, dead or thriving, that they anchor. Also I actually prefer carpeted walkways to tiled ones, but I can understand the liability and cost of care. I know some other malls had Venture, but I haven’t confirmed if those stores ever became ShopKo too. @Bobby, I’d be surprised if any of these ShopKo locations remodeled and started using the new logo. I know Green Bay’s Bay Park Square ShopKo and Appleton’s Northland Mall ShopKo are starting to use the new logo on their buildings, as well as other ShopKo stores in Wisconsin. There are a few ShopKo stores strewn throughout the western half of the US that use the older balloon-like logo from the 1970s/1980s, but the majority still use the red/blue crillee font logo from 1992 that was recently discontinued as of late 2007. This mall must’ve been made in a time where they viewed the future as being filled with gaudy neon signage. Anyone else thinking of Bladerunner? The ShopKo at Bay Park Square in the Green Bay suburb of Ashwaubenon is still thriving. I live in Green Bay, so I should know. I take the Metro bus out there frequently. The only thing that should come into question about Bay Park Square is the vacancy of Elder-Beerman follwing a sale of Younkers to Bon-Ton. Not all the ShopKo stores in shopping malls cease to exist and this is proof. I hope you cover Bay Park Square next. Justin — look above, I made a list of other malls still anchored by ShopKo. My mall has neon too, but its brighter inside and less neon. The Shopko at Bay Park Square in Green Bay, WI has a HUGE mall entrance and two exterior entrances. It makes this Shopko’s mall entrance look like a door. The Shopko store at Bay Park has a design that is based off of the 1999 prototype where the shopko store in those pictures is based off of a ’93/’94/’95 prototype with battleship gray walls and checkered red/blue/gray patterns. 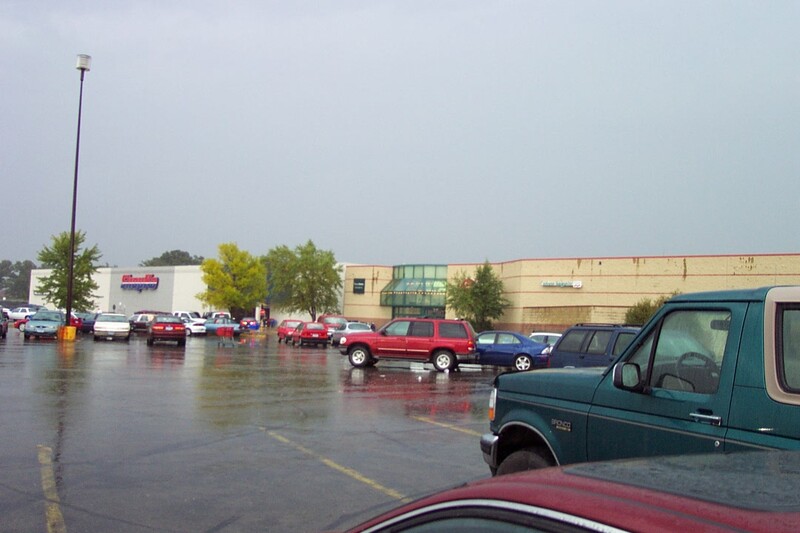 The Northland Mall in Appleton, Wisconsin is another mall in NE Wisconsin to have ShopKo as an anchor store. 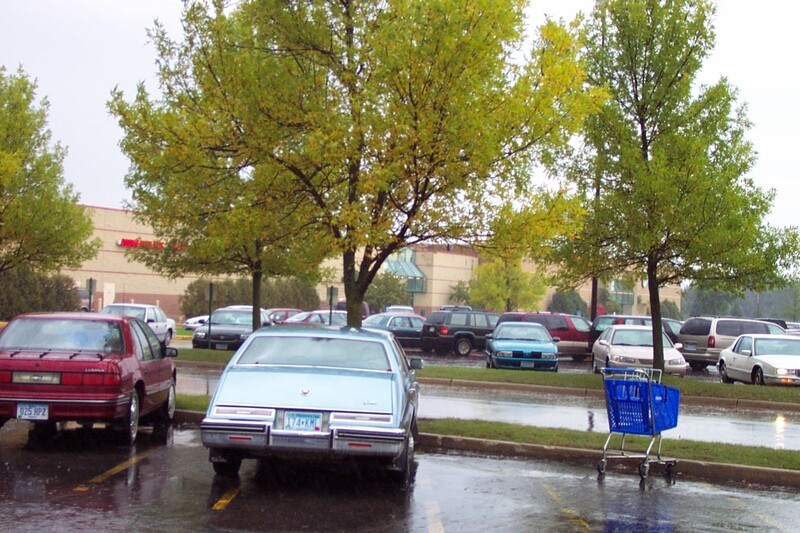 Shopping malls from the Midwest to the Pacific Northwest often have a ShopKo rather than a Kmart, Target, or Walmart. I really hope they plan to remodel this ShopKo store seen here in Albert Lea, MN, to its current prototype, to boost consumer interest in that mall during the next holiday season. i uploaded a blog on the history of ShopKo on my blog, known as BlogKo. I hate it when mall websited DONT have their maps! How am i supposed to know where they have stores i like! BTW, aparently the mall is getting Dunham Sports and Claire’s is closing. I hope they decide to give that ShopKo a much-needed makeover, fro their generic Midwest discounter-type look with red, blue, white and gray, to the look they currently have now, which consists of brown, beige, hunter green, and terra-cotta. Maybe they should start with remodeling the exterior, as welkl as the mall entrance, by painting it beige, and adding the brown SHOPKO logo. I found the mall directory! Huh. The Dunham’s space used to be a Hy-Vee Warehouse. If anyone here is interested, I have blogged about ShopKo store #001 at BlogKo. @Justin Hill, The blog has been renamed ShopKo Fan Club. Two of the three ShopKo stores in Colorado were converted to JCPenney, in case anyone from outside Colorado hasn’t heard. ShopKo closed their Colorado and Nevada stores in 2005. Shopko announces merger with Pamida, converts all Pamida stores to Shopko Hometown stores. Say what you want about the 80s decor, I personally love it and hope they never touch it. 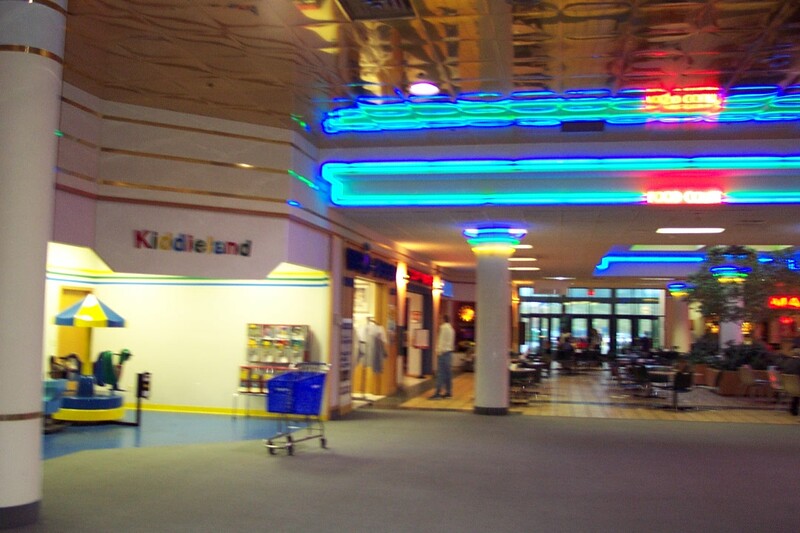 This mall is part of my childhood.